Maybe I'm boring, but I almost always order fajitas when we go out for Mexican. What can I say, I know what I like. It's not that there aren't suitable options. I live in Texas after all, and where barbecue does not reign supreme, there's TexMex! So I decided to learn how to make my own fajitas at home. 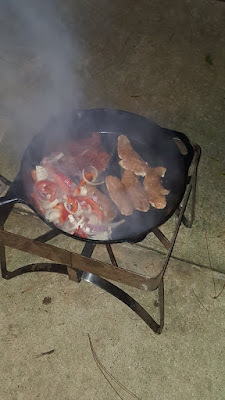 I started out just grilling the meat, but soon switched to cast iron. If all of the restaurants are serving fajitas on a cast iron platter, there has to be a reason, right? Heat the cast iron skillet over a flame. I use a 15 inch cast iron skillet and an outdoor propane burner. Marinate the onions and bell peppers in a gallon storage bag with olive oil and salt and pepper. Sometimes I'll throw in a few cloves of chopped garlic. Season the skirt steak with your favorite fajita seasoning. I'm working on my own fajita seasoning that I'll share as soon as it is ready. Drizzle the steak with a little olive oil to prevent sticking. When the cast iron is scorching, throw on the skirt steak. Put it all the way to one side. Flip the steak after just a few minutes. This is going to cook really fast. I like mine to be about a medium rare at most. Add the onions and peppers on the other side. Make sure to stir those veggies often. You want them to blacken, without burning. Slice up the skirt steak and pile it high on the tortillas with the onions and peppers. I like charro beans in my fajitas. Of course salsa and cheese, and sometimes guacamole. I've never been a sour cream fan. I don't like lettuce on my fajitas, because I'm not eating tacos. Fajitas go great with pico de gallo. I've got a great recipe for it here!